Last night, I photographed the end of an era. 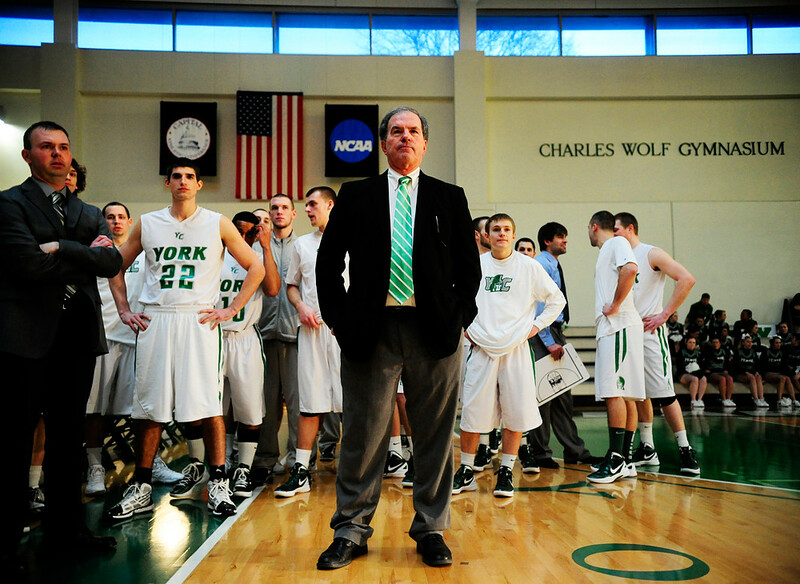 Rewind: A few weeks ago, I was assigned to a York College men’s basketball game. Not unusual, except the assignment was to make pictures of the coach, who had announced he would retire at the conclusion of the season and who stood gruffly during a short, pre-game ceremony that honored his tenure. © 2012 by The York Daily Record/Sunday News. York College mens basketball coach Jeff Gamber, center, stands in front of his team's bench as an announcer recognizes his achievements and tenure as head coach in a pre-game ceremony on Saturday, Feb. 11, 2012. Gamber will have served as head coach for 36 seasons. The man showed no emotion… until the game began. © 2012 by The York Daily Record/Sunday News. 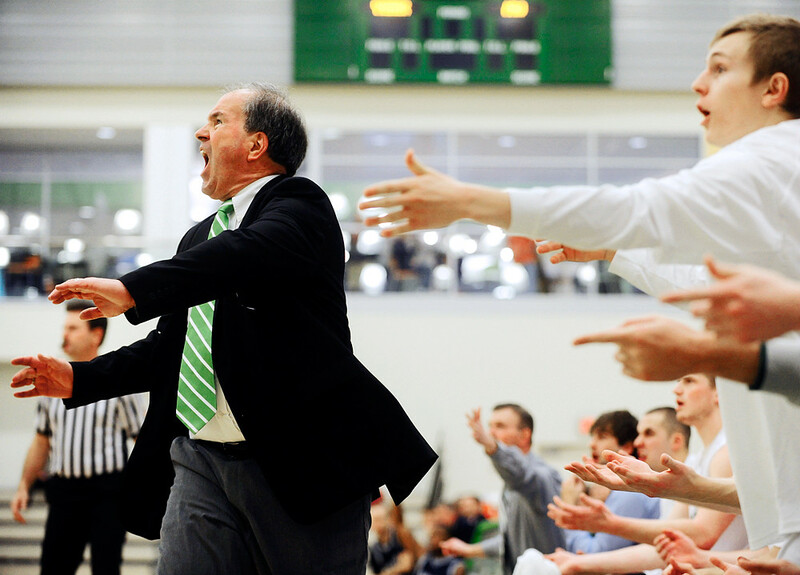 York College mens basketball coach Jeff Gamber, left, reacts to a play by a Mary Washington player during the first half on Saturday, Feb. 11, 2012. Those photos ran the next day. Then, last night. It was the first round of the NCAA Division III tournament, and for the first time since 2006, York College was in. If the Spartans lost, it would be Jeff Gamber’s last game. If they won, they’d live on to see another game the next night. York College lost, 72-50. And, after the post-game handshakes, Gamber returned to the stands, beckoned his wife out of the crowd and left the court, grasping her shoulder with one hand and wiping his eyes with a tissue in the other. © 2012 by The York Daily Record/Sunday News. 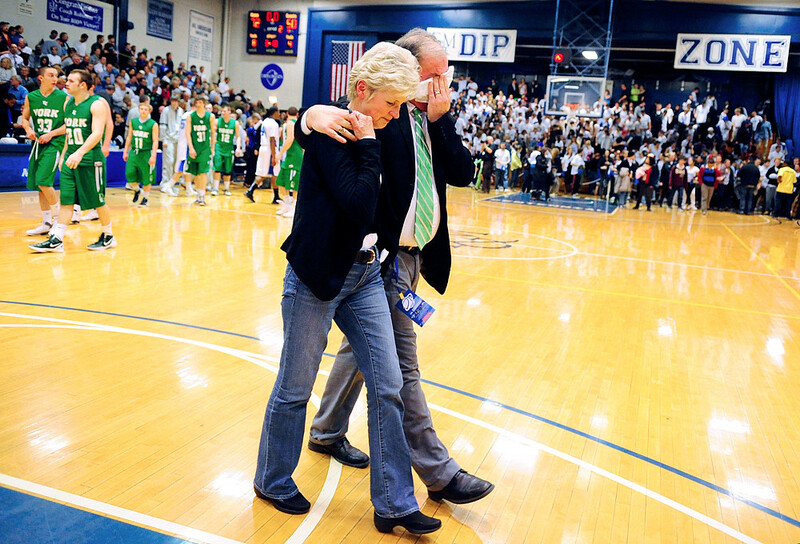 York College men's basketball head coach Jeff Gamber and his wife walk off the court after York College lost 70-52 to Franklin & Marshall College in the first round of the NCAA Division III tournament on Friday, March 2, 2012, at Franklin & Marshall College. Today in the office, one of the sports reporters and I remarked on the photo. “I was surprised he was emotional,” I said.